GIANT wall art is a perfect process art project. 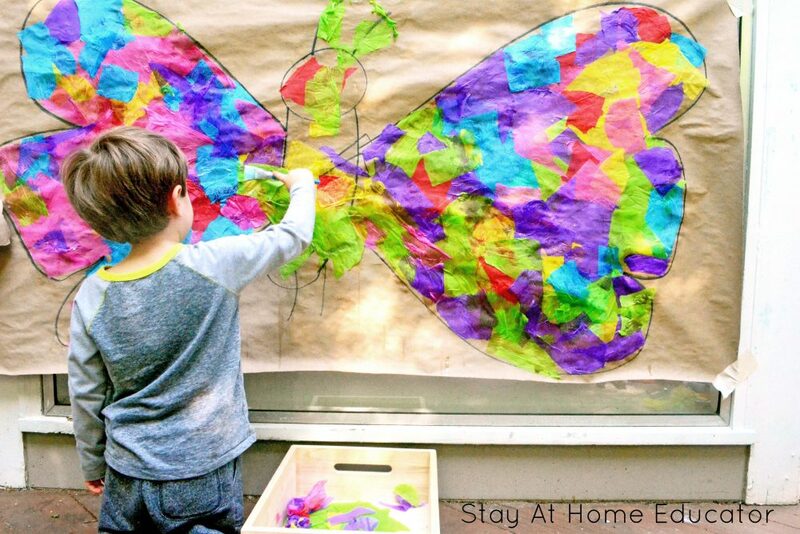 This butterfly collage art for kids will strengthen your preschooler’s gross motor muscles by holding their arm up to a vertical surface. It will also help hand-eye coordination as they balance holding two objects (the paper and brush) at once. After a recent trip to the Dollar Store, my sons now have their very own butterfly net. Now, one would think this is a really great thing! Which it is. But the catch (literally) is they are capturing more people than butterflies. So we had to take a break and redirect our new love for butterflies in other ways. This giant wall collage art does double duty. Not only is it diving deeper into Eric Carle’s collage work, but it is also offering preschoolers an ALL day invitation to create. You see, when something is GIANT, there doesn’t need a start and finish time. You simply put it up and let them come and go. It’s brilliant, actually. This giant wall art college also requires minimum art supplies. This spring, allow GIANT process art to be your go-to activity. It takes little prep work and pairs brilliantly with Eric Carle’s The Very Hungry Caterpillar. 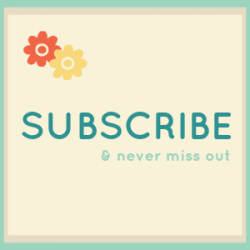 You will also find many books for spring on this spring book list! 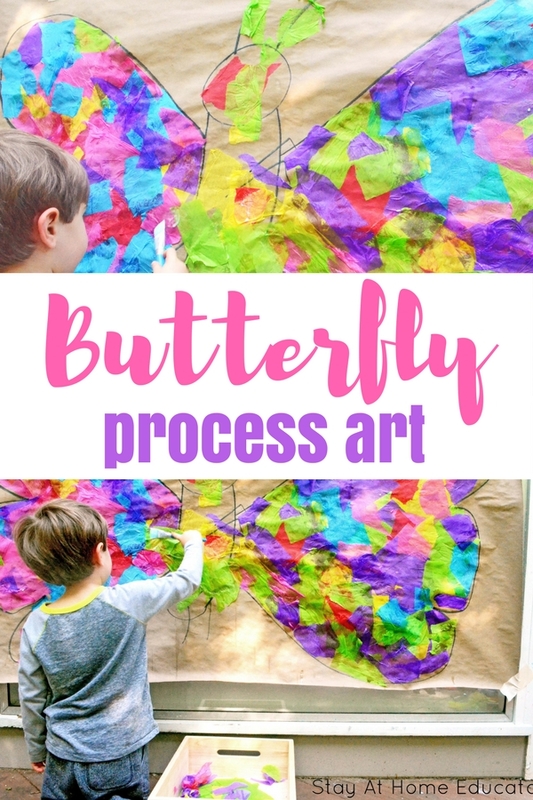 Before I share this GIANT process art butterfly with my preschoolers, I want to first revisit The Very Hungry Caterpillar. Again, here I am prepping my preschoolers for our GIANT process art butterfly. After the story, I let a little time pass. I may wait a couple hours, or perhaps a day or two. Just enough time to give my preschoolers some room for free play in between our discussions. 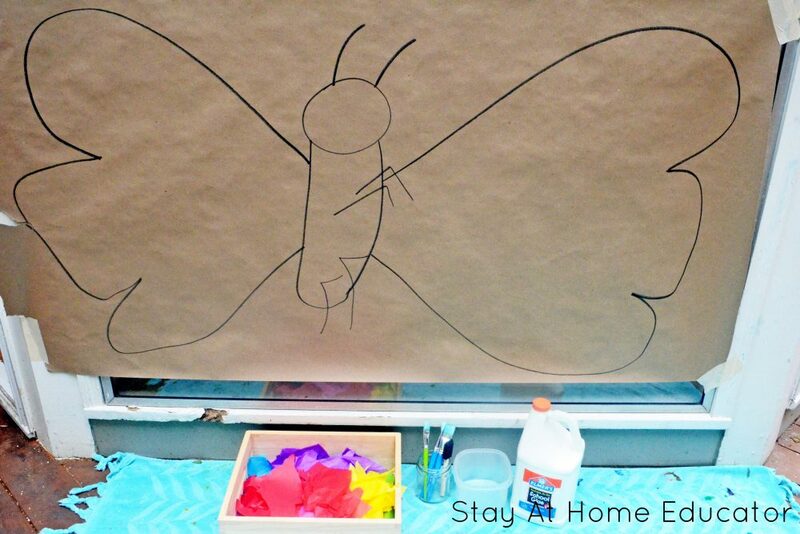 I also take this time to hang a large piece of kraft paper to a vertical surface and draw a quick and easy butterfly. Place the paintbrushes, tissue paper and glue mixture next to the wall. Before allowing my preschoolers to dive right in, I briefly refer back to our book and share with them how Eric Carle makes his collage illustrations for his books. I like to demonstrate how to add “just enough” water/glue mixture to make the tissue paper stick to the paper. For this process art activity, my four-year-old got it right away, but my 2.5-year-old got frustrated the paper was sticking to his fingers. He was not ready for the hand-eye coordination that was needed to hold the paper in one hand and glue with the other. Guess what? I didn’t push him or force him to do it. I know he will when he is ready and we offer plenty of activities for him to develop strength in other activities that we do. Also, remember when I said process art doesn’t need to have a strict timeline? Well, I really meant that. There is no way I would expect my four-year-old to decorate his butterfly within a certain amount of time. This is the exact reason why I love process art. 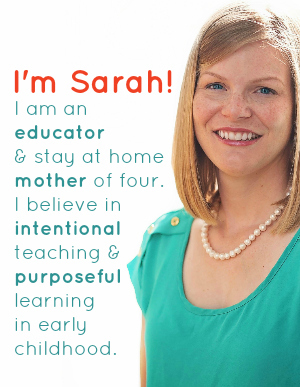 It allows your preschooler to dabble in and out to spark creativity when they see fit. This process art activity is also very calming since we worked outside. It offered an invitation to create ALL DAY LONG. We even worked on it a little the following day! 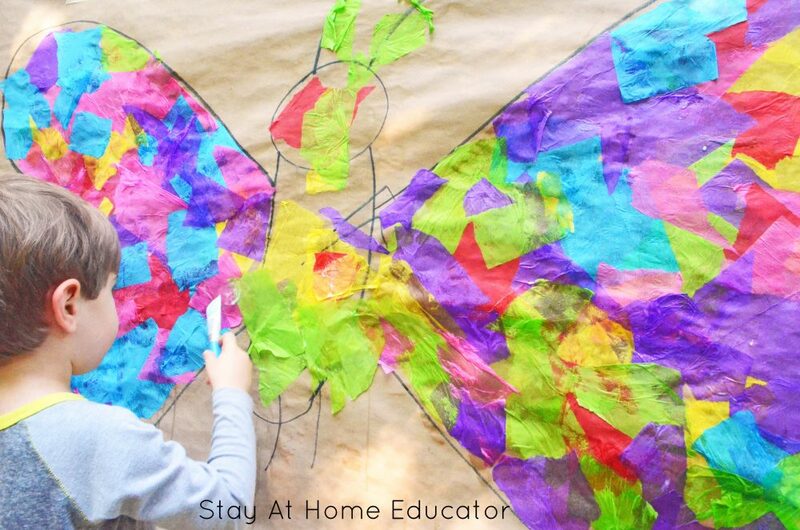 You will want to get this collage art for kids activity set up before summer hits! Enjoy the cool air, and excitement of The Very Hungry Caterpillar. 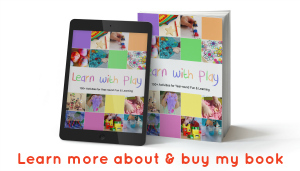 If you love this book, you will also love these other two great ideas posted here. Wonder how I plan my mornings? You will love this collection of Breakfast Invitations that allow for a calm start to our day as I drink coffee and prepare breakfast. Hey, this looks fun, but just to let you know, this isn’t process art. 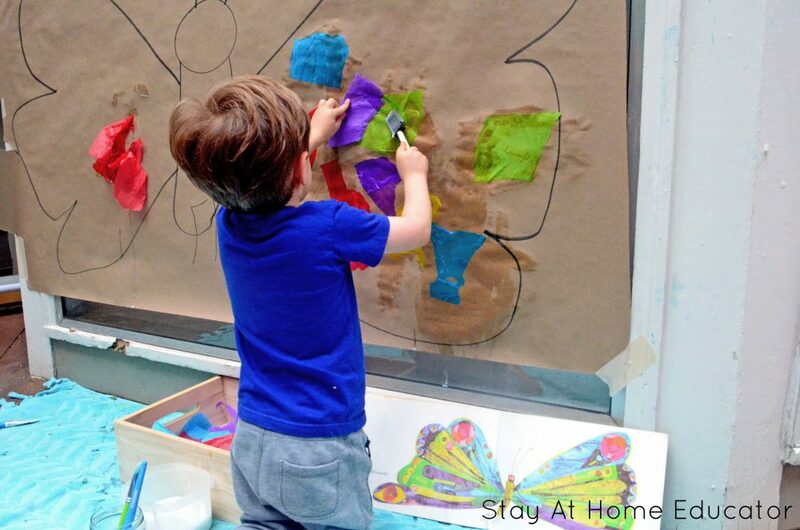 Process art is as it sounds, all about the process – letting kids explore materials in their own way, not telling them how much glue or water to use and outlining what shape they have to stick the paper in. Process art is completely designed and created by the child, not the parent. Not saying this isn’t fun and interesting for kids, but you used the term process art incorrectly multiple times in this article so I thought I’d give you a heads up. I respectfully disagree. The author who created this did not impose on the children. 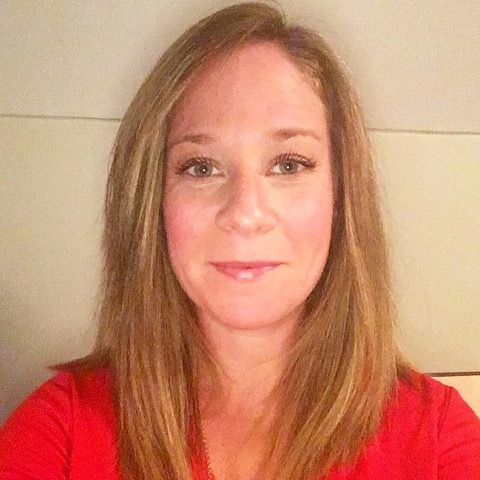 The butterfly outline was chosen in advance so that it would pair with the unit she was teaching, however, the adult remained a facilitator rather than a director. Maybe this isn’t process art in it’s most pure sense, however I certainly wouldn’t define this as a craft either. I also don’t believe there is any problem with teaching children how to appropriately use materials. For example, wouldn’t an adult intervene if a child were to try cutting his hair or shirt rather than the materials provided? And I, for one, wouldn’t want liquid glue dripping down my walls and onto the floor, so I understand the author mentioning it to her children. I think these are tiny limitations that don’t really impede the process.